Cold weather always calls for a bowl of soup. The great thing about a puréed soup is that it is fairly easy to make and much healthier than its creamed cousins. Cauliflower is a good vegetable to make into soup since it will have enough texture after blending that it won’t require cream to give it body (unless of course, you want it). But despite being so light, it still has a nice hearty feel to fill your belly and warm your core on those chilly days. Enjoy it on its own, or garnish with herbs, croutons, or toasted seeds. 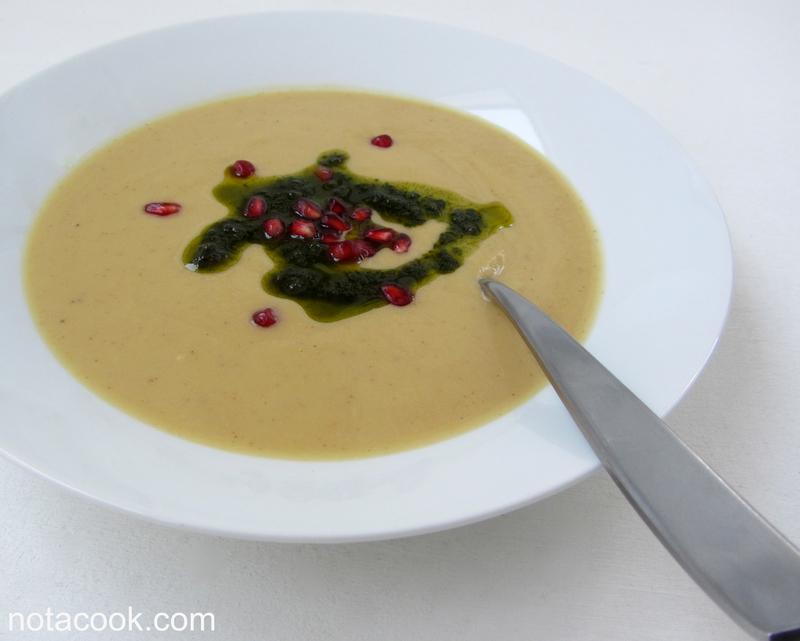 In this instance, I dressed the soup with a drizzle of basil oil and pomegranate seeds. 1. Separate the cauliflower florets. Discard the leaves and any tough portions of the stem. 3. In a large stockpot, heat a couple tablespoons of olive oil over medium heat. Sauté the cauliflower and onions with a large pinch of salt and pepper until the florets have begun to brown and the onions are translucent. 4. Add in enough vegetable broth to just cover the florets. Cover and bring to a boil, then reduce heat and simmer until the cauliflower is tender, about 10 – 15 minutes. 5. Purée the soup in a blender until completely smooth. Work in batches if needed. 6. Return soup to the pot, season to taste with salt and pepper. * Blending Tips: For efficient puréeing, only fill the blender 3/4 the way full. Keep firm hand on the lid, the heat pressure can pop the top off!